Don’t Panic. Most are just tiny little “nips” that feel like pinches, and there is not much to be done other than to try to figure out why you were bitten and how to prevent it in the future. Review our article How to Encourage a Hedgehog to Release a Bite, to better prepare you should a bite occur. Most hedgehog bites barely break the skin and a simple hand washing is sufficient to prevent infection. However, if the bite is more severe and breaks the skin more than a pin-prick (rare) you will want to wash the area directly with soap and water, treat with an antibiotic ointment and cover with an adhesive bandage. The reason a hedgehog bites will determine if you should immediately return your hedgehog to its cage after a bite. Normally friendly hedgehogs that bite out of spontaneous bad behavior can be returned to their cage as a form of punishment. One of the most important things you can do for a grouchy hedgehog is NOT to put your hedgehog down. This can be the response your hedgehog wants and so putting the hedgehog down can be a positive reinforcement. Instead, simply hold your hedgehog away from your hands (such as in the crook of your arm) so that your hedgie can relax, but not get its way. Although incurable hedgehogs are rare, there is a possibility that hedgehogs just want to bite. After all the above prevention and behavior modifications have been tried, it may be necessary to do a “skin test”. To do this test, wear the gloves that have been used previously so that your hands are covered. Expose your arm so that the hedgehog has an opportunity to smell your skin. Hedgehogs that attempt to bite or do bite may simply have a personality flaw. 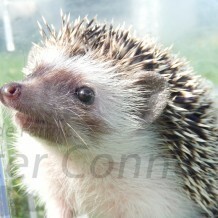 Most breeders will exchange a biting hedgehog if you have worked with the breeder and followed their suggestions. Based on the research for this article, a hedgehog bite from a healthy hedgehog on a healthy individual is at no more risk for infection than any other skin injury. Signs to look for that may indicate a mild infection are swelling, redness, and possible swelling. This can typically be avoided with proper cleansing of the wound area. Tetanus shots and/or boosters are recommended for all animal owners. Immune compromised individuals are more at risk for more serious infections and should be watched more closely for symptoms beyond a mild infection.